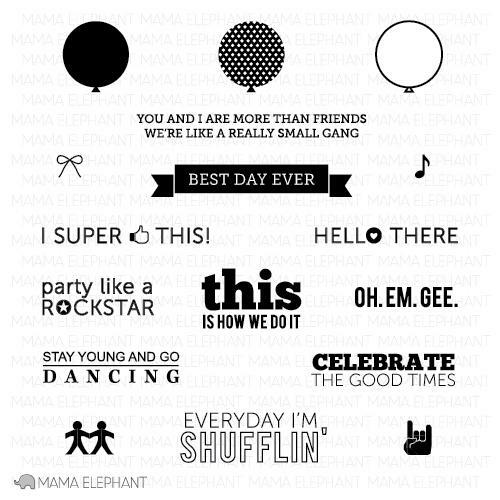 "Mama Elephant is owned and operated by two childhood friends from NYC. We are so happy to bring the collaboration of our aesthetics to Mama Elephant! Our stamps are designed with card makers and scrapbookers in mind! Our stamps are carefully curated to provide optimal versatility with a wide variety of styles - cute, whimsical, bold, graphic, and fun!" For my card, I used the fun set called Good Times! Aren't these the best sentiments? And one little quick card for the Mama Elephant gals! Thanks so much for popping in! If you're working your way through today's blog hop, you should have arrived from Lucy Abrams! The next stop on this stampede is Mariana Grigsby! If you've just jumped into this stampede, don't worry! 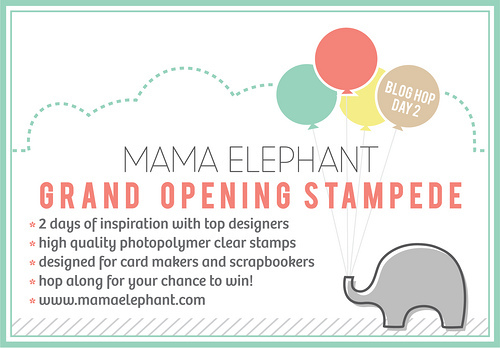 Just click on back to the beginning at the Mama Elephant blog so you don't miss a thing! And just for today, the gals are even offering a 10% discount on all the stamps (just use the code "GRANDOPEN"). Great cards! Love the cards! The "I super (thumbs up) this!" sentiment is so novel!!! love it!!! Great cards! 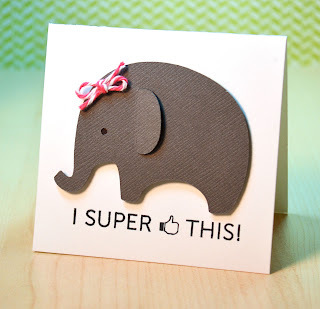 Love the cute elephant card you made for the Mama Elephant ladies! Adorbs! These are both absolutely fabulous cards!!! LOVE that stamp set!!!!!!!! the sentiments are amazing! and your cards are just as amazing!! love the little elephant shout out! :) ha ha! Love your cards, JJ. The elephant with a twine bow is so darling. LOVE these! That elephant card is to die for! So cute JJ! I LOVE the elephant and the sentiment on that card! Love these cards! TFS your balloon card... I can't wait to try it out! Both lovely cards, very cute elephant image!! These are fabulous, JJ! I especially love that baby elephant! 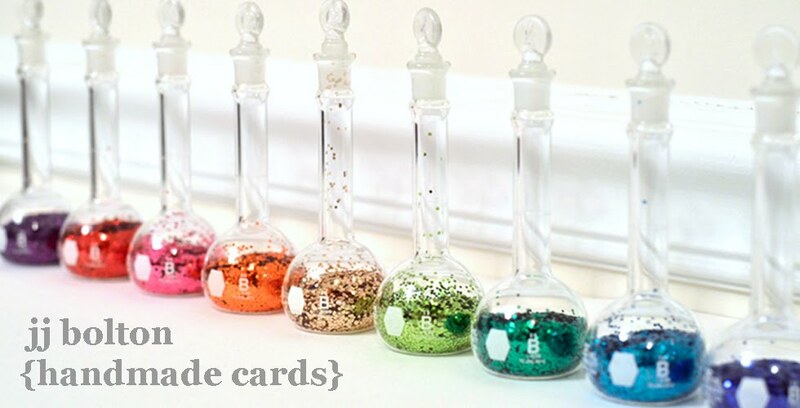 adorable images and sentiments on these cards. Great cards, I love the elephant! These are both super cute!! Love them!! Now I've got to love the Oh.Em.Gee because Connor says that ALL THE TIME! lol :) And a really small gang? Holy crap, these are fun!! Love those balloons, but I super thumbs up love that sweetie little elephant! Great cards love the CAS.. really love them. so cute! I want this set just for the "I super like this" sentiment! How delightful, JJ!! Love your creations today! These are such adorable cards! LOVe your best day ever card! both cards are really adorable! Very cute. This set set has some great sentiments. Fabulous creations! Love the twine with the balloons! Ha! Love the elephant card! I love those balloons too! Great cards! Hey lady! Who can resist these cute stamps seeing cards like this!?! Love the twine and the balloons! such fun cards, JJ!!! fabulous work as always! Love both of your cards. Very clever way to do the balloons. Your cards are great. I especially like the phrase on the elephant one and how you put the thread through the balloons on the first one. Both cards are just precious! I love that set and think your card is a perfect example of how to use it. Very fun balloon card and cute elephant! Oh.my.gee...I super (thumbs up) love your elephant card. Love your colorful balloons and the sweet elephant, both with wonderful twiney goodness! Thanks so much for sharing! Great cards. Love the balloons. Your cards are wonderful, and they really showcase these new stamps. Now I want to get my chance to play with this set! great cards, love the dimensions! Love both cards - the elephant one is great too! Wonderful cards! I love the colorful balloons =) TFS! How precious to make the elephant card for the owners! I know that they are thrilled to have you as a DT member!! 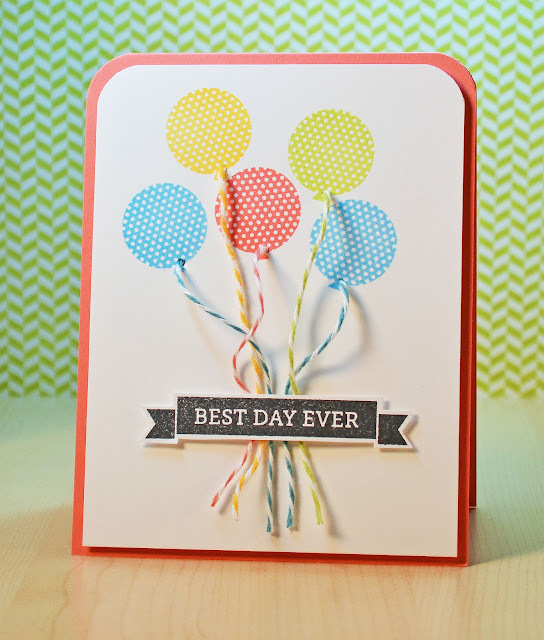 Love their stamp sentiments and how you made the balloon card! Just great! So creative! Love that background you created on the first card! That elephant card is super cute, too! Love the sweet elephant and the fun sentiment! Super awesome sentiments! Am definitely gonna have to get my hands on these. :) Love the strings on your balloons! Online Card Class: Holiday Card Workshop Winner!